Arrive Qingdao and airport pick up by local tour guide. 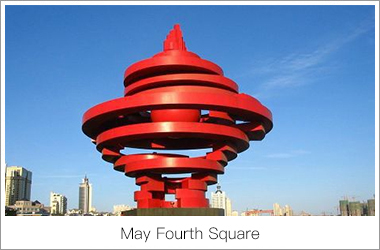 We will start our touring with the May Fourth Square. The square is one of the most popular tourist attractions in Qingdao and is bordered by the city government to the north, the sea to the south, and residential and commercial buildings on either side. On pleasant days May Fourth Square fills with young couples on the ground and kites in the air. 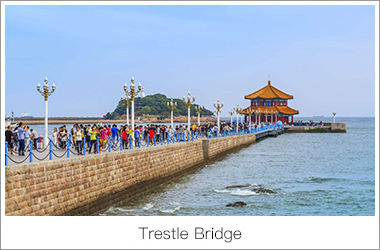 Coming up is Trestle Bridge, as a symbol and landmarks of Qingdao City, looks like a rainbow lying in the water. Then have a visit to Qingdao Olympic Theme Park. This iconic park was built in 2008. As you step inside, you will find there is a structure of a huge torch in the center of the park as a symbol of the 2008 Olympic Games. Check into the hotel for rest after dinner. After breakfast, we will visit Xiao Yu Shan Park. As the first park hill with a style of classical gardens in Qingdao, this top terrace of this park offers tourists a fantastic panoramic view of Qingdao. Follow by visiting St. Michael's Cathedral outside. St. Michael's Cathedral, is also called the Zhejiang Road Catholic Church. It is the largest example of Romanesque Revival architecture in the province, resembling a German cathedral of the 12th century. 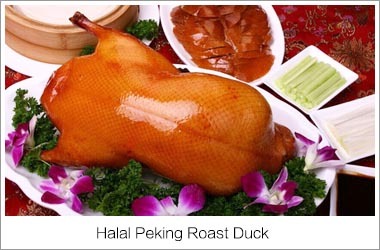 Picai Yard locates in the Jiangning Road which is between Zhongshan Road and Hebei Road, where is famous snack street of Qingdao. 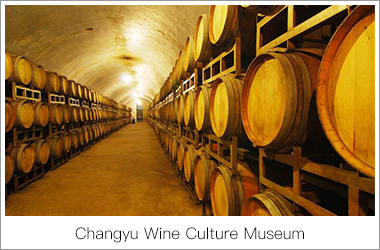 Then we transfer to Yantai by bus and have a visit at Changyu Wine Museum(include wine-tasting). The museum was established in 1992. As the only specialized wine museum in China, it tells the story of the Changyu Winery and attracts a large number of famous people and tourists from home and abroad. 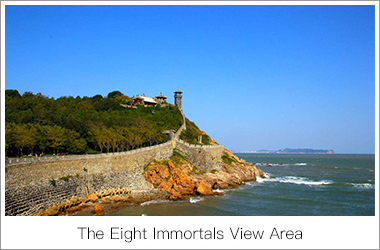 After breakfast at hotel and transfer Penglai Pavilion Scenic Area-The Eight Immortals View Area by bus (2 hours). 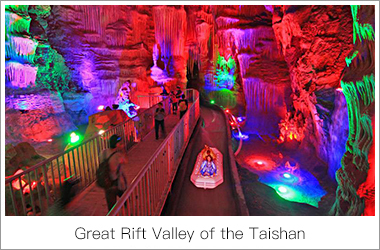 It is known as the landing place of the Eight Immortals in the old Chinese mythology. 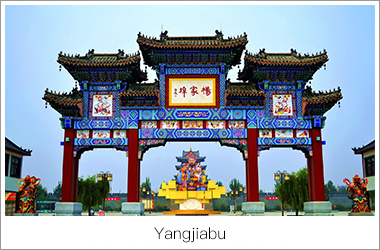 Then transfer to Yangjiabu. Yangjiabu is a great village for Chinese traditional folk art. Inside the village, the Yangjiabu Kite Factory, built in 1986, is famous for the largest of its kind nationwide, and now has gradually turned into a showcase, namely Yangjiabu Folklore Garden, for kites, woodcut new year pictures as well as other forms of local folk art. 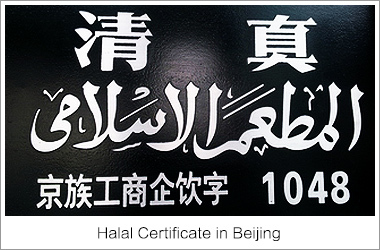 Day 4: Weifang, Zhoucun Ancient Commercial Street, Bus to Jinan, Salat at Jinan Great Southern Mosque, Daming Lake, Black tiger Spring, Lotus Street. 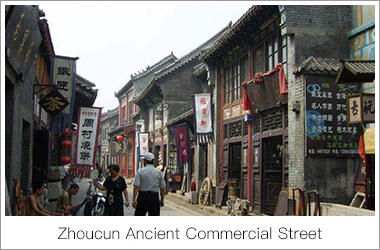 Today we will firstly visit Zhoucun Ancient Commercial Street. Zhoucun is a national historical and cultural ancient commercial five-arched, lu shang culture birthplace, famous movie and television filming base of three major brands. Well-known scenic spots have thousand Buddha temple group, modest economic profit, employees, etc. 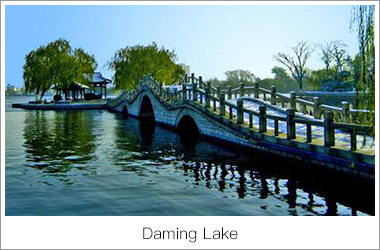 Then we will transfer to Jinan by bus (2 hours) and have a tour at Daming Lake Park. The lake is reputed as the pearl of the city of springs. After dredging up, cleaning, renovation and expansion of the building, the lake has become one of the famous scenic spots in Jiannan City. Main visiting spots in the Daming Lake Park include Lixia Pavilion, North Pole Pavilion, Jiaxuan Ancestral Temple, Minghu Pavilion, Tiegong Ancestral Temple, Xiayuan Garden, and Little Canglang Pavilion. Then we will visit Black Tiger Spring, also called Heihu Spring, is one of the four largest spring groups (Baotu Spring, Pearl Spring and Five Dragon Pool) in Jinan. Free shopping on the Lotus Ancient Street, which is probably the most bustling street in Shandong province. 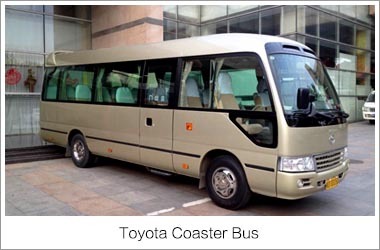 After breakfast at hotel, transfer to Qufu by bus (2 hours). 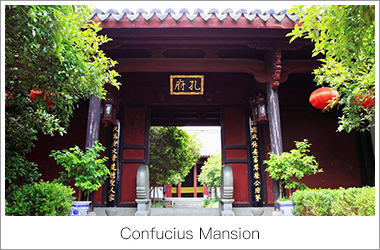 Start our visiting with the Kong Family Mansion, Temple and Cemetery of Confucius (include transportation). 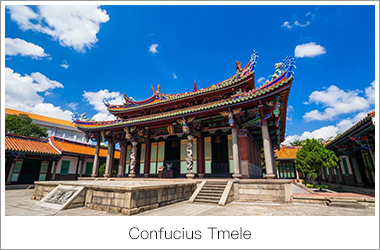 Since 1994, the Temple of Confucius has been part of the UNESCO World Heritage Site "Temple and Cemetery of Confucius and the Kong Family Mansion in Qufu". The two other parts of the site are the nearby Kong Family Mansion, where the main-line descendants of Confucius lived, and the Cemetery of Confucius a couple kilometers to the north, where Confucius and many of his descendants have been buried. Those three sites are collectively known in Qufu as San Kong, i.e. "The Three Confucian". After breakfast at hotel, transfer to Taian by bus. Arrive at Great Rift Valley of the Taishan (included drift). 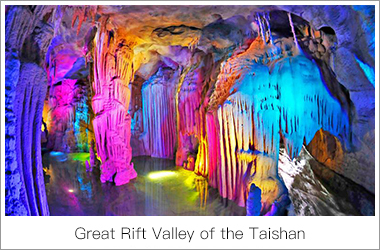 The Great Rift Valley of the Taishan is a underground attraction in Shandong Province, a colorful underground world of stalagmites. Followed by the visit of Goddess Pool, also called Yao Chi. It is a small and rather quaint-looking nunnery, from where you can see the whimsically named Hornless Dragon Pool and Combing and Washing River. In the main hall of the nunnery is a statue of Xiwang Mu, Queen Mother of the west, the major female deity in Taoism. After breakfast at hotel, transfer to Qingdao by bus (4.5 hours). 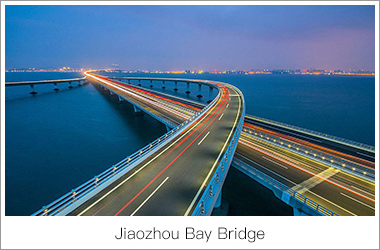 We will drive pass the world's longest bridge Jiaozhou Bay Bridge. This bridge is 42.5 kilometers long, and this project costs 4 years to finish, 450,000 tons of steels and 2.3 million cubic meters of concrete were used and 10,000 workers were being involved. It is designed to be able to withstand severe earthquakes, typhoons, and collisions with ships. Arrive in Qingdao, we will visit Tsingtao Beer Factory/Museum (include wine-tasting). which lies on the old site of the Qingdao Brewery Company. Tsingtao Brewery is a world-famous manufacturing enterprise in brewing industry. 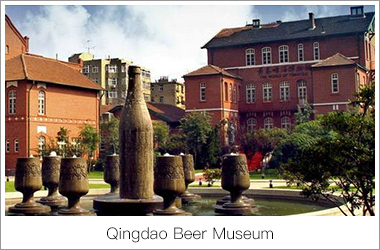 At present, the museum owns 55 brewing factories and malt factories in 18 provinces of China. The one-hundred-year old Tsingtao Beer has created its own history and culture. 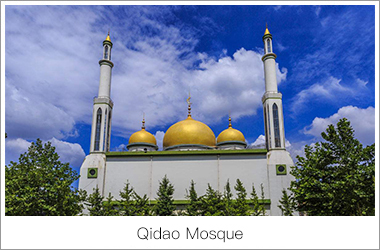 Qingdao Mosque is a new type temple with unique design. It is a combination of Chinese traditional and Arabic-style architecture. The temple is a two-floor building, which covers an area of 4,000 square meters. The imam office, meeting room and teaching room are set up in the first floor. The second floor is the prayer hall, which is spacious and bright. The huge crystal lamp is hung on the center of the roof, shining on the whole hall. In every Jumah Day, there will be 400 to 500 home and abroad Muslim people coming here to do prayer. And coming to the Eid al-Fitr and Id al-Adha festival, the number of the Muslim people will reach to 5000 to 6000. 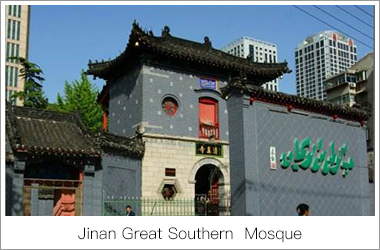 Jinan Great Southern Mosque was first built in Yuan Dynasty(1271-1368). 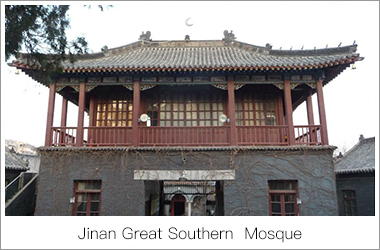 It is the oldest mosque in the city of Jinan, Shandong Province, China. 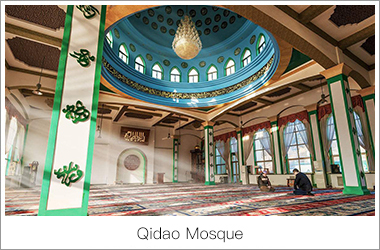 The mosque, covering an area of 6,330 square meters, is located in the west and opposite to the east. The major constructions are the main gate, moon building, prayer hall, bath house, teaching room, office room and other facilities. The moon building divide the whole yard into two small quadrangle courtyards. All the constructions are ranged in an axis. The Wyndham Grand Qingdao (Qingdao Yinshatan Wendemu Zhizun Jiudian) is a contemporary low-rise beach resort that emphasises its natural surroundings. The hotel is located 55 minutes from the airport and 30 minutes south of downtown Qingdao, overlooking the city skyline and the silver sand beach. The hotel boasts 518 luxuriously appointed guest rooms and suites as well as five specialty restaurants and bars. With access to a private beach, an indoor pool and a spa, the hotel is a luxurious leisure destination and also the closest international luxury beach resort to Beijing and Shanghai. Additionally, there are 12, 800 square metres of meeting space and the largest pillar-less grand ballroom in mainland China, capable of seating 3, 600 guests and making the Wyndham Grand Qingdao an unparalleled destination for meetings and events. 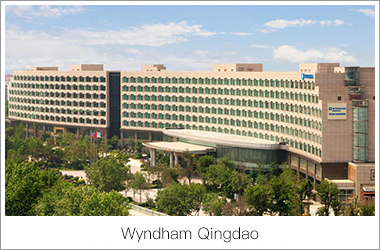 Whatever the purpose of one's stay, they are sure to feel welcome at the Wyndham Grand Qingdao. 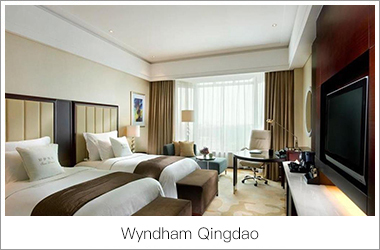 Wyndham Grand Qingdao welcomes guests to experience exotic flair. Come and enjoy Shandong hospitality in this stylish beach resort. 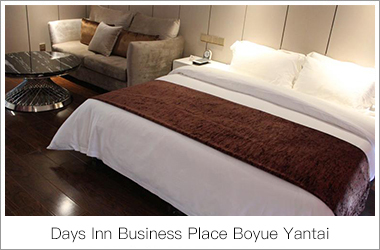 Located in Laishan District in Yantai, Days Inn Business Place Boyue Yantai features spacious guestrooms and a restaurant. Free WiFi is accessible in all areas. It also offers free parking for staying guests. 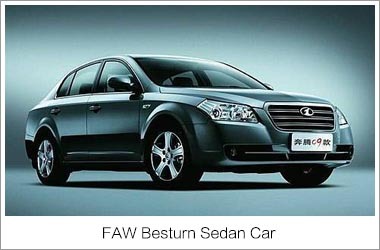 It is a 7-minute drive from Yantai South Railway Station while Yantai Railway Station is a 25-minute drive away. 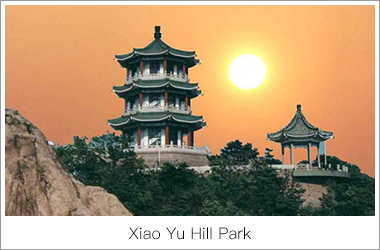 The nearest airport is Yantai Penglai International Airport, a 50-minute drive from the hotel. 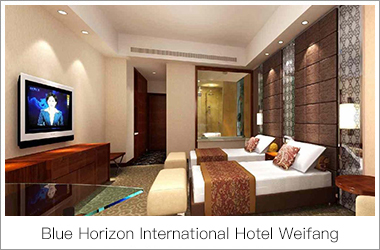 Rooms here are all air-conditioned and come with a satellite TV, a seating area with sofa and in-room minibar. Enjoy a cup of coffee from your terrace or balcony. Private bathroom is fitted with a bathtub and shower. There is a 24-hour front desk at Days Inn Business Place Boyue Yantai, where guests can store their luggage. Staff at tour desk will gladly help with tickets booking and car hire. It also has a kids' club and library on site. 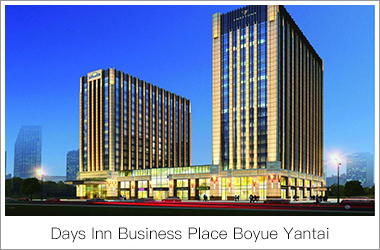 Days Inn Business Place Boyue Yantai has been welcoming Booking.com guests since 18 Nov 2016. 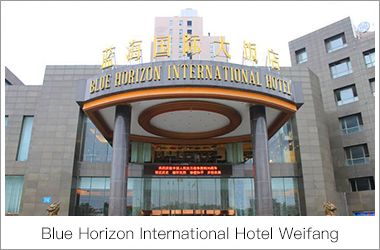 Blue Horizon International Hotel Gaomi is a 5 star comprehensive hotel which is located in Gaomi Development Zone of Weifang City. It is adjacent to Economical Technological Development Zone. To its East borders on tourist city Qingdao. The hotel is facing Jiao Lake and near to railways and expressways which formed a communication net that radiated to all the directions. Numerous tourist attractions surrounded it. Taking 10minuts to train station by drive.15minuts to the entrance of Jiannan to Qingdao Expressway. 15minuts to Jiaozhou International airport. It boasts 21 floors with 310 exquisitely designed rooms including no-smoking rooms. You can enjoy free gym for health as well as swimming. KTV and Massage. 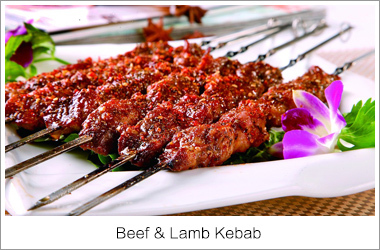 There are 4 Chinese restaurants that featured with specialty cuisines and fishing foods. A Western restaurant and a Coffee Bar are available for your relaxation and exotic tastes. We have few surroundings around us which would leave you a secluded natural environment and noiseless air. All of our staff will be waiting for your arrival with our cordial profession. 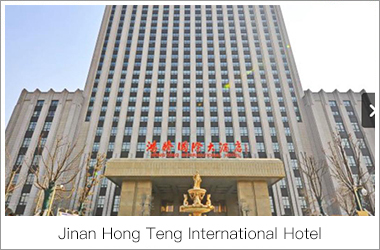 Featuring a free fitness centre, Jinan Hong Teng International Hotel is situated in Jinan, 6 km from Jinan Hongjialou Church and 7 km from Shandong Provincial Museum. 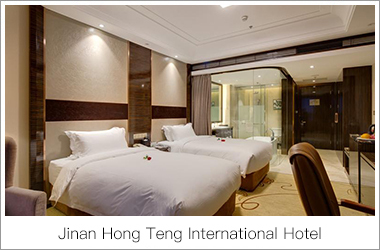 You will find a spa and wellness centre at Jinan Hong Teng International Hotel. It also has a 24-hour front desk. Black Tiger Spring is 10 km from Jinan Hong Teng International Hotel, while Jiefangge is 10 km away. 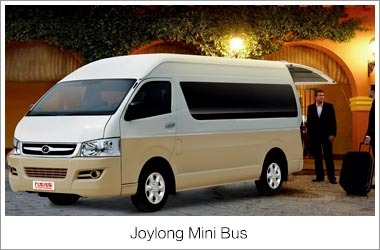 The nearest airport is Jinan Yaoqiang International Airport, 18 km from Jinan Hong Teng International Hotel. 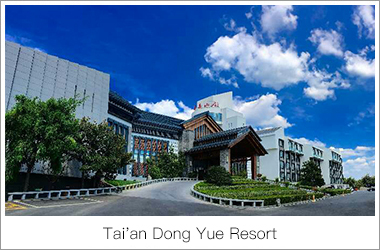 The Dong Yue Hotel (Dongyue Shanzhuang) is a business hotel located in southern Taishan. 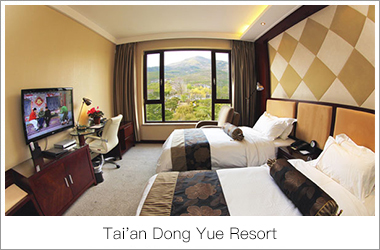 Close to the Taishan Mountain Scenic Area, this hotel is a great choice for those wanting to emulate the emperors of old and climb to the peak. This Taishan hotel is equipped with flat screen TVs, work desks and other luxurious facilities, and offers apartments, guestrooms, business apartments and single-rooms. 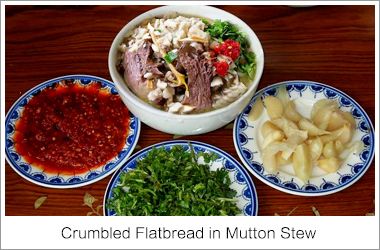 Chinese regional specialties are available in the on-site restaurants giving guests a taste tour of the country’s culinary diversity. For the convenience of business guests, the hotel's International Convention Hall is equipped with a simultaneous interpretation system, and nine meeting rooms are available, the largest of which seats up to 280 people. 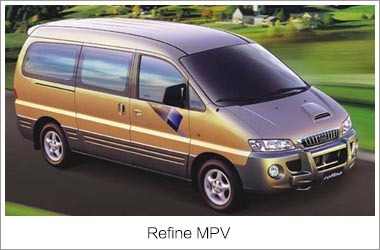 There is also an on-site travel agent to facilitate all further travel. Whether guests make it to Taishan’s peaks unaided or with the help of the cable car, the hotel’s sauna and massage facilities are on hand to sooth aching feet. Those with energy to burn can take advantage of the tennis courts, a swimming pool and gym, while those just looking for pure fun can hit the bowling alley, golf simulator or dance hall.